Earlier this month, during the formal inauguration of Volkswagen Bonifacio Global City, Ayala Corporation president and COO Fernando Zobel de Ayala revealed that the Philippine VW distributor, Automobile Central Enterprise, was also opening dealerships in Cebu, Quezon City and Alabang. ACE is one of the many companies owned by Ayala Corporation. That revelation is now beginning to come to pass, as the appointed Volkswagen dealer in Cebu, Iconic Dealership, has already broken ground for its showroom facility that will soon rise on A. Soriano Avenue in North Reclamation Area in Cebu City. 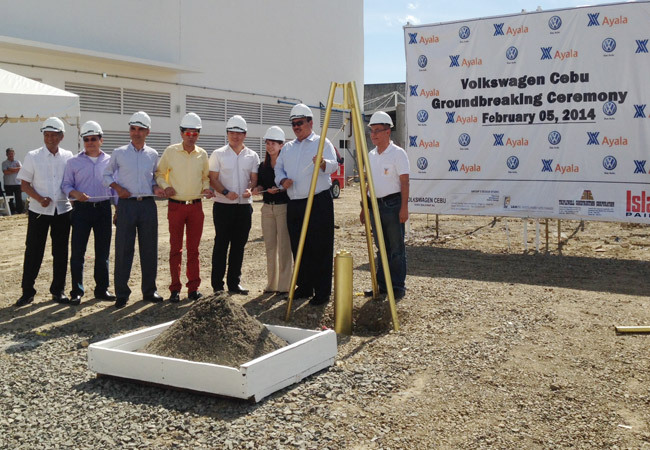 The ground-breaking ceremony was attended by ACE president and CEO John Philip Orbeta, Architect Edwin Gumila, Volkswagen BGC branch manager Erwin Locsin, and Cebu City Mayor Mike Rama, among others. Volkswagen Cebu is expected to be "fully operational toward the end of 2014." Watch for it.